Vis, a small island just west of Split, was my favorite of all the places we visited in Croatia & Bosnia. Until the 1990's, Vis was a military outpost. The island had a few forts, but was largely left untouched. Now as a public island, Vis (the island and city) is small & quant. There are 2 parts of the village, the old and new city center, which are within 10 min walking distance of each other. Old stone buildings make up the majority of houses. People walk or bike to get around (there are not streets for cars). Both city centers are situated right on the water and have docks for boats. All in all, it's a quant, sleepy island. The pace in Vis is much slower and very relaxing. Our apt in Vis was nice but slightly strange. The bedroom was upstairs and the kitchen & bathroom downstairs (we had to walk outside, through the courtyard, to get to them). In addition, there were pics of dead people - dead relatives to be exact - hanging on the walls of the bedroom - relatives of the owner. These were similar to the pics at the Haunted House in Disneyland. The owner of the house proudly told us the life story of all the dead relatives. As soon as she left, those promptly were removed from the walls along with the huge picture of the Virgin Mary hanging over the bed. Nightmares anyone? Our first night in Vis, we arrived exhausted & hungry. Not wanting to walk far, we ended up at 1 of 4 restaurants near our apt in the old city center. We were told this would have vegetarian food (to appease the 2 vegetarians), however that was definitely not the case. We did a great job offending the host, and possibly owner, of the restaurant. First, we showed up in our travel clothes, which were definitely less stylish than the clothes of hte other partons (all who must have come from yachts). Second, we asked him for veggie food. His snooty reply: "this is a seafood restaurant." Yet when we contemplated moving restaurants, he did promise us that they could do veggie which didn't work out. Their idea of veggie was cooking the vegetables with fish, and then removing all large chunks of fish before serving it. So thirdly, he was annoyed that we didn't love the food. We'll be invited back there soon. The rest of Vis was wonderful. The next day, IM & KS took a boat trip to the world-famous blue caves (Modra Spilja) on Bisevo. I went scuba diving at the green cave (Zelena Spilja) on Vis and also did a 2nd dive at under-water pyramid rock formations. For the first time in my life, I saw a thermocline. A thermocline is when the water changes temperature drastically in the course of 1-2 ft. Usually this is felt, not seen. However, the temperature switch was so extreme in water near Vis (went from 25 to 15 degrees Celsius), that we actually saw the thermocline. It looked like spilled oil in the water. The rest of the afternoon, I found a place all to myself on the side of the Vis harbor and relaxed (IM & KS were still on their outing). That evening, we cooked a pasta dinner then went to an outdoor cinema. There is 1 theatre in Vis. It's located in a small courtyard right next to the water. Every night, a different, current film plays. We saw Angels & Demons. It was the perfect way to spend an evening. The next morning we left bright & early on a 2 hour Catamaran. Before we left, we had to hang the dead people back up. Ugh. More nightmares. 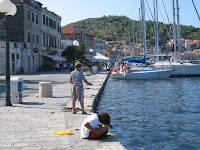 Pic1: Boys fishing at the main street in Vis. Pic2: The son of 1 of the divers who joined our trip; the captain promised him an icre cream cone upon return if he behaved well. 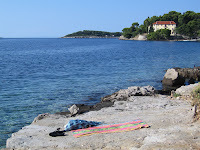 Pic3: My relaxing spot on the shore of Vis harbor; this type of stone slab is typical to find at the beaches in Croatia.